Native to a place. people”? These terms are used, often interchangeably, to describe the population living in North America before Europeans arrived. Native often implies that a person was born in a specific place. At one time, of course, Native people were new to North America—migrating gradually from Asia thousands of years ago. Indigenous most frequently refers to plant or animal species that evolve in one location. Nevertheless, “indigenous people” is sometimes used to refer to the native people of North America or other continents “discovered” by Europeans. The term "Indian" came from the conviction of some Europeans that North America was really the East Indies. Canadians use the term "First People, " which may be the most accurate although it is not typically used in the U.S. In Our Maine Ancestors we use "Native" or "Indian, " while asking readers to think about how historical and social perspectives influence language, and vice versa. 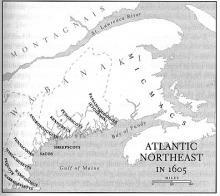 According to the Indians kidnapped by George Waymouth and James Rosier, who explored the coast of Maine in 1605, the Natives called this area Mawooshen..
To the Europeans, it was a new world—but Mawooshen was an ancient homeland to a people who had lived here for at least 12,000 years. A fast-growing pine tree with white wood and smooth gray bark. Often used for ships' masts in the past. trees (referred to as fir by Rosier) grew over 200 feet tall and could reach as much as 10 feet in diameter. Later, these trees furnished masts for ships of Britain’s Royal Navy. Within the forests covering Maine and the Canadian Maritime Provinces lived about 32,000 people, about 41 per 100 square miles. Tribal groups moved from the coast to inland areas according to the season and the availability of food. Some Maine tribes practiced agriculture west and south of the Penobscot River, but were limited by the short growing season and poor soil. For the most part, the Natives had abundant wild food and resources to meet the need of their population. Indians viewed possessions, especially land, differently from European explorers and settlers. They believed humans shared a social relationship with animals, trees, rivers, rocks, and plants. No one individual “owned” these common gifts of the earth. Since tribes moved around frequently, they did not accumulate many possessions. A hut of the Native Americans of the Great Lakes region and eastward, typically having an arched framework of poles overlaid with bark, rush mats, or hides., containers, and canoes, and to line cellars for food storage. Bark containers could be plain, or elaborately decorated with incised designs and porcupine quills. Today’s artisans continue the tradition, sometimes with modern motifs. The Abbe Museum in Bar Harbor has many Native American items. 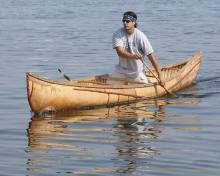 Utility played a large part in the survival of the bark canoe. 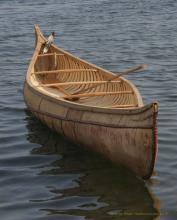 Bark canoes were built to outfit sporting camps, and continued to be used by guides, lumbermen, and anyone who needed a light, portable boat. Sporting camps, springing up after the Civil War, provided a ready market. In the late nineteenth century, wood and canvas canoes superseded bark, in part because of the scarcity of canoe-sized birch trees.